Rejoice, rejoice, take heart in the night, though dark the winter and cheerless. The rising sun shall crown you with light, be strong and loving and fearless. Love be our song and love our prayer and love be our endless story. May God fill every day we share and bring us at last into glory. Hello again! Since my cheery post on the first day of Holidailies, I’ve been jingling, but not writing. I’ve been x-rayed, scanned, ultrasounded, EKG’d, and had a cardiac catheterization. No hidden anomalies in the structure of my heart have been revealed. I am now waiting for a date for my surgery to be determined. “You’ll feel so much better after this is fixed,” they keep saying. But I feel great now. My depression has lifted, my thinking is less fuzzy than it was. But I do get tired. I’ve ordered gifts, and put up my Advent wreath, but I think that’s going to be it for fa-la-la. Today is Saint Lucia Day. I didn’t bake today because Ron has been experimenting with a pie version of his sfratti, the Italian walnut-honey delight our daughter, Lynn, writes about here. (And do hop on over to give her some page views!) The house is full of enough gooey versions of this that I don’t need to add to the carbohydrate overload that is so tempting. But I do want to remember the joy I have always taken in Saint Lucia Day. Here, from 2004 and the original version of this blog, a sweet memory, and a picture of Lynn at five. Thank you for reading, so much, so often. This spectacle captured my imagination and it gradually became part of my Christmas mythology. The year that Lynn was born, a woman named Pleasant Rowland founded a company that produced dolls featuring American girls from a number of immigrant cultures. One of them was Kirsten, a 19th-century Swedish girl. 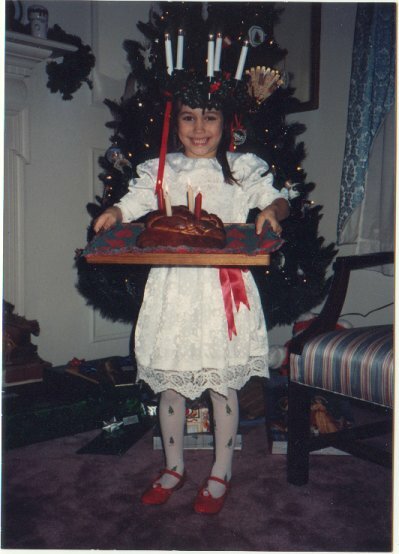 When Lynn was about four I bought the Kirsten doll and her St. Lucia Day paraphernalia. I also bought the girl-sized crown and made a white dress and sash for Lynn. There have been times in my life when December was filled with darkness. Not only have I from time to time had personal sorrows at this season, I also am subject to Seasonal Affective Disorder, a form of depression that occurs at the onset of the dark days and can persist until spring. Some years the effects have been pronounced, even when conditions in my life were not complicating things. This is not one of them.